Gill is a retired laboratory assistant for the coal board before moving in to educational work, and Howard is a retired chemist. They have lived in this house for the past 33 years. How did your garden develop? GILL: The basic garden layout has not changed since we moved in. The people before us were an older couple, and the garden was wild. We still have some of the original roses, which are probably 60 years old. The roses have to be replaced every so often. The pond was dug by Howard for my 40th birthday. He looks after the fish, but keeps finding that the herons are taking them. How do you design your garden? GILL: I… don’t. I have some thoughts about what I would like. Someone drove in to the front wall last year, so we had to rebuild the wall, and I replaced the majority of the plants as they were damaged. I had Monty Don’s jewel garden as a basic concept, so I was attempting a mix of bright purples and oranges and reds. I also have an area that is more like a woodland to the side of the house. I like to plant up spring bulbs to pop in there. 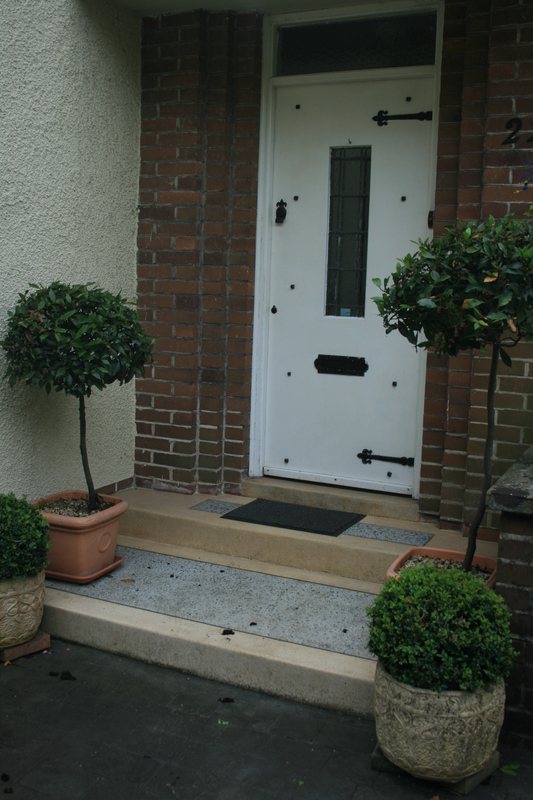 We have also widened the pathways around the house, and we move pots around when they come in to flower. The cherry tree and the rowan by the front wall are both self-seeded trees, which we have kept and shaped. We have a maple that we planted when we moved in to the house. The branches are now spreading out after removing a competing tree, and I have planted a black elder to complement the leaves. We have joined the National Trust, and I seem to be visiting these wonderful places and always coming away with a new plant. How do your surroundings influence your garden? HOWARD: When we moved in to the house, the walls were dirty from the pollution from the road vehicles. I could clean it up with chemicals, but the dirt kept coming back. I planted a Virginia creeper to try and protect the house from the pollution, but it was requiring me to cut it back three times a year, and I was too busy, so I removed this vigorous climber and we have replaced it with roses and clematis. We have to paint the house to keep the walls from looking dirty now. 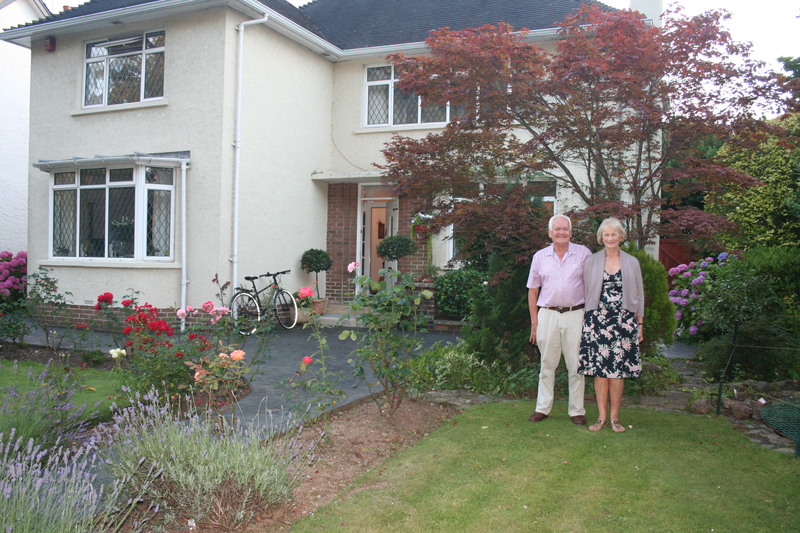 GILL: When we moved in, the trees in Roath Park wild gardens were about half the height. They would probably reach the house if they fell over now. However they provide shade during the summer, but allow the light through in the winter. HOWARD: The adjacent road has a magnolia tree avenue, which is stunning. It takes work to clear up the huge number of leaves generated from these trees each autumn. Plans for the future of your garden? GILL: I think from now on, whenever a rose is replaced, I will start ensuring that the roses have a good scent as well. While Gill and Howard may think they don’t plan their garden, they have nevertheless created a garden where you want to spend time. Roses will always make me want to stop and appreciate the different colour combinations and the scents of the garden. A perfect rose bloom seems to beg for someone to appreciate it’s beauty.